You can get the following message "Your password was changed X days ago. Didn't change your password?" and links to the following article. 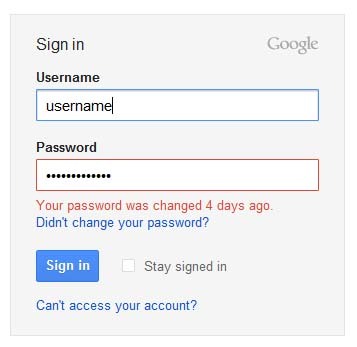 This will happen when you try logging in your account after changing your Google account’s password. It looks like you’ve attempted to sign in using an old password. If you remember changing your password, just sign back in using your most recent password. If you remember changing your password but have forgotten your new one, you can regain access to your account by going to our password assistance page. If you don’t remember changing your password, someone else might have accessed your account and changed your password. In some cases, your previous recovery email or phone might be available on the password assistance page for resetting your password. If that’s not the case, you’ll have the option to fill out our account recovery form to verify your identity and reclaim your account. In order to show this message, Google has to store the old password (actually, a password hash, since Google doesn't store the actual password). You can find this useful when someone else manages to access your account and changes the password.